HEC Montréal and the College of Management Academic Studies (COMAS) are pooling their expertise to create IQbator, an international virtual business incubator. The agreement was ratified during the trade mission by the Mayor of Montreal, Denis Coderre, to Israel and the West Bank. This innovative virtual incubator will allow entrepreneurs from HEC Montréal, Université de Montréal, Polytechnique Montréal and COMAS to collaborate and transform their ideas into concrete business ventures. “Innovation and research are among Montréal’s main economic drivers that benefit from the presence of our world-class universities, and from a dynamic innovation ecosystem. This partnership between HEC Montréal and Israel’s COMAS will allow our city to pursue its quest for excellence as a city of innovation and research. The interdisciplinary approach, openness and international synergy that our universities are increasingly seeking are key elements that make Montréal Canada’s leading university city. The introduction of the IQbator will strengthen an international collaborative network that enriches both HEC Montréal and COMAS,” said Montréal Mayor Denis Coderre. Developed by professors from the Entrepreneurship, Entrepreneurial Acquisition and Business Families Hub at HEC Montréal and COMAS, the IQbator will provide simultaneous online coaching in Montréal and Tel Aviv, bringing together the participating entrepreneurs on a bilateral team. “A first pilot IQbator cohort will be in place in early 2017. We hope that the participants will be able to draw on the expertise of the professors at our two business schools, to help them develop promising startup projects,” added HEC Montréal Director Michel Patry. As part of the agreement between HEC Montréal and COMAS, Montréal participants in the IQbator will also have the opportunity to spend some time immersed in Israel’s entrepreneurial ecosystem and meet with some of its economic players, including mentors, repeat entrepreneurs, heads of companies and investors. Israeli participants will also have a chance to explore Montréal’s dynamic environment at a final Demo Day in Montréal, along with the local entrepreneurial community. 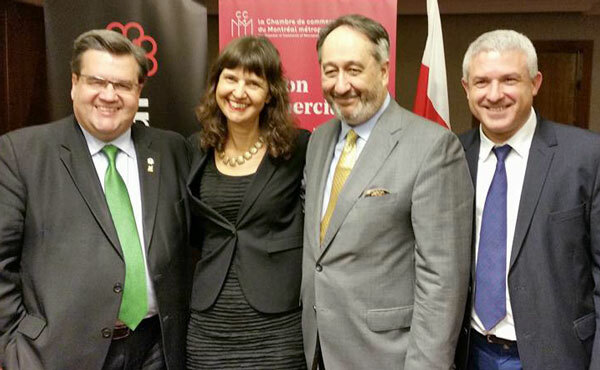 Photo: Denis Coderre (Montréal Mayor), Dafna Kariv (Chair, Department of Strategy and Entrepreneurship and Director of NOVUS, Center of Entrepreneurship, College of Management Academic Studies), Michel Patry (Director, HEC Montréal), Oren Kaplan (Dean, School of Business Administration, College of Management Academic Studies).